The Royals put me in a weird position. It’s not because their two consecutive pennants make skeptical and critical analysts look stupid — we went over that a year ago, and previously, we went over the same stuff with the Giants. If anything, that part of this is just funny. No, the Royals put me in a weird position, because they make it tempting to believe in ideas that run contrary to what I’ve been taught. I’m not supposed to believe in a team’s vibe. I’m not supposed to believe in a team’s unkillability. I’m not really supposed to believe in powerful and particular things, because baseball is intensely competitive, and it doesn’t make sense that one team would ever have a secret. I’m not supposed to believe the Royals are more special than any other team. Than, say, the Blue Jays. And I’m not saying I do believe in the Royals’ magic. They’re just pretty good at sucking me in. It’s a baseball team that makes me think twice about assumptions I have about baseball teams. The ALCS isn’t going to have a Game 7. Would’ve been fun, but this was a plenty good way to wrap up. The ALDS between the Rangers and the Blue Jays came to an unforgettable conclusion, a very wild and unpredictable conclusion, but aside from the tie-breaking home run, that memorable inning turned on a series of defensive mistakes. Just before the homer, the whole inning was sloppy. That might’ve been baseball around its most entertaining. What we just saw in Game 6 was baseball in the vicinity of its best. The Royals and Blue Jays competed in a classic, and, of course, the Royals won. They’re the Royals, after all. I don’t know exactly how we got here, but I can tell where we are on the map. Sure, that’s a graph of approximations, and sure, math can never know a team’s true odds. If you believe in the Royals as a sort of team of destiny, then your plot would never dip below 100%. But if we treat the Royals like any other team, that’s what you get. Less than two weeks ago, in Game 4 against the Astros, the Royals went into the eighth inning facing elimination and facing pennant odds under 1%. Out of that rally has come everything else. A critical part of that rally was a Carlos Correa error on a would-be double play, but everything counts. Baseball’s a game between two teams; on that play, the team facing the Royals didn’t execute. It’s all the same as a year ago, if we agree not to argue details. The Royals badly want to convince you they have something going on. You might remain a stubborn and skeptical outsider, but this is basically a perfect sort of team for a fan base. A baseball game is typically seen as a sequence of innings, or events. Because of what I do, from my perspective, a baseball game is a sequence of potential story ideas. As one idea passes, you’re on to the next, and eventually you’re left with one or two things, having discarded another one or two dozen. This could’ve been about David Price. Every game could’ve been about any number of players or happenings. Price, of course, has fought some postseason demons, and the interesting thing about his Game 6 was that he was both tremendously effective and uncommonly hittable. Early, the Royals knocked him around, and got him for a couple of homers. Then he settled in, and kept striking guys out. Then, toward the end, he came a hair from allowing a two-run homer to Salvador Perez. Price certainly looked like a Cy Young candidate; he just didn’t look like that the whole time. It was his second such start of the series. This could’ve been about the Jays’ situational hitting. They wasted a leadoff double in the first. They wasted consecutive walks to lead off the fifth. They wasted a one-out double in the sixth. On, and on. The Jays would tell you they didn’t execute well enough in big situations. That was the story of the whole ninth inning. But just so it’s acknowledged and not forgotten, with two on in the fifth, Josh Donaldson lined out to Mike Moustakas. According to Statcast, Donaldson hadn’t hit a baseball harder all year long. He is the probable league MVP. Kelvin Herrera came out throwing 100. When the game was 2-1, Herrera threw 100, also mixing in changeups and a breaking ball he’s featured far more often than usual in the playoffs. Only in October have Herrera’s results really matched the visual of his repertoire. The regular season might just be his warm-up. And when the game was still 2-1, John Gibbons called on Aaron Sanchez to relieve David Price. Over the last two years, if you set a minimum of 50 innings, no reliever in baseball allowed a lower OPS than Aaron Sanchez. Not Aroldis Chapman; not Wade Davis. Sanchez allowed an insurance run to score. It felt like the ballgame. The Royals bullpen doesn’t fail. And then, incredibly, it failed. It failed in part because of Ned Yost. Instead of going to Davis for two innings, which he’s shown he can do, Yost lined up Ryan Madson for the eighth. Yost suggested he didn’t want to have Davis pitch on the wrong side of the rain delay. He still did. In the eighth inning, the Blue Jays sent their best hitters to the plate. It should’ve been Davis. Most everybody recognized it should’ve been Davis. To be totally fair, Madson had a great season. He actually allowed a lower OPS than Herrera. It wasn’t inevitable that Madson would blow the lead, but he’s no Wade Davis. Against the Astros, in that same Game 4, it was Madson on the mound when the Astros seemed to drive the nails in the coffin. It was a mistake to use Madson in that spot. That close. That close to the thing that happened not happening. Bautista got lucky. Madson made a mistake. The Royals formula doesn’t fail. Not in the playoffs, not like that. When they’ve handed leads over to Herrera and the rest of the bullpen, the leads have held up. It’s been automatic, and it’s felt automatic. This was new. A mistake was made managing the Royal bullpen, and then a mistake was made by the Royal bullpen. The people went quiet; the people wondered about the magic. Then Wade Davis restored the magic and stranded the go-ahead runner. It was rain that could’ve ruined everything. It was rain that could’ve left Wade Davis unavailable on the other side. It was rain that threatened to be a major part of the story. And then the Royals wrote their own story, and the rain is all but forgotten. Lorenzo Cain walked. He took a decent low and away, full-count slider, and he walked. Then Lorenzo Cain ran. He didn’t stop until there was nowhere left to run. What the play-by-play shows you is that Cain scored all the way from first on a single. That is, indeed, what happened, although it wasn’t a single like you might imagine a routine base knock. It was, let’s say, a single and a half, but that was enough, as Cain is fast and Cain is smooth. It all led to a situation thought to be impossible: people noticed the third-base coach, because he did something good. Mike Jirschele has something of a postseason history, and I’m sure there are some who still haven’t forgiven him for the way the last World Series turned out. But Jirschele read the play, and had observed that Bautista always would throw to second base. Jirschele didn’t hesitate, and so Cain didn’t hesitate, and so Cain scored with relative ease. The rain washed the disappointment of the top of the eighth away. In the bottom, the Royals re-claimed the lead, and they gave it back over to the formula. There was concern that Davis would be rusty. Yost kept him in, and Davis went a full hour between pitches. If he opened the ninth missing, though, he wasn’t missing by a lot. Still, Russell Martin quickly singled. And when he was replaced by Dalton Pompey, Pompey stole second on the very first pitch. Pompey didn’t try to time Davis; he went for the surprise. It was all the more surprising when Pompey stole third in the same at-bat. And when Davis walked Kevin Pillar, a funny thing happened — the Royals’ win expectancy dropped below 50%. Of course, that doesn’t account for the Wade Davis factor. But there was a time, in the ninth inning, that the Jays were arguably favored, even though they were losing. They had a situation many opponents could only dream of. Within minutes, Royals players were looking for goggles. That’s a ball. Even if it’s not a 100% ball, it’s a majority ball, so Revere had a legitimate gripe. The tying run was 90 feet away; Revere is one of the game’s very best contact hitters. It’s a big difference between 3-and-1 and 2-and-2 — batters had a 1.050 OPS after 3-and-1 counts, and a .585 OPS after 2-and-2 counts. Revere probably felt like he didn’t need to be punished extra while going up against maybe the best short-stint pitcher in the game. But the call was the call. The next pitch was better, and Revere whiffed. It came down to Davis and Donaldson — maybe the game’s best reliever against probably the league’s MVP, where an out would win it for the Royals and a hit would put the Blue Jays in front. It took four pitches, the last with something just barely taken off. After three straight pitches at 97, Davis threw one 95, with five more inches of sink. Donaldson hit the top of it, and prayed for an error. Errors weren’t there to save the Blue Jays in this elimination game. Of course you’d like it to be a little cleaner. You’d like to not have the Ben Revere call looming so large in the ninth. The previous game had its own controversial call, but that one was a lot more of a coin flip — the Revere call wasn’t so close. It’s not fun to have to talk about these things, but they also can’t just be ignored. Blue Jays fans have to live with a big call going against them. Royals fans have to live with other people talking about it. (They don’t have to pay attention to them.) Sometimes baseball isn’t as clean as you want it to be. But, you know, maybe Revere hits a grounder right at a guy. Maybe he pops out, or flies out shallow. Maybe he fouls out, or still whiffs. It was still Wade Davis out there. Nothing can be assumed, except that the next pitch would be a good one, no matter what. I don’t like it when these things linger, and there’s far from any certainty the Jays find their tying run. There’s no thinking your way out of the unknowns. There’s just coming to terms with them. And coming to terms with another Royals American League pennant. We know they’re not genuinely unkillable, because Madison Bumgarner ultimately killed them. The Mets have three starting pitchers who had regular seasons as good or better than Bumgarner’s 2014. When we talk about the Royals’ ability to come through in the clutch, I think a lot of us do it with partial grins. We all recognize that special teams shouldn’t exist. But if one were to exist, it might look a lot like the Royals do. All credit to them — they really make you think. It might be the thing I find most refreshing. We hoped you liked reading There’s Something About the Royals, or Something by Jeff Sullivan! How Unlikely Is Daniel Murphy’s Streak? Great article. I came here this morning hoping to answer one question: what was the win-probability swing on that second “strike” to Revere? ESPN used to have a win-probability box in Gamecast, which was always my favorite part. It was a sad day for me when they axed it. Anyhow, the link you gave doesn’t go to the pitch-by-pitch level, right? Anyone know of a place to find it? I’d also be curious to see how those two botched strike calls affected the Jays win probability. Or their probability to at least tie the game in the 9th. The incorrect call to Navarro might have been just as harmful to the Jays chances. Davis was able to go back to the same, virtually unhittable pitch to get Navarro to “chase” strike three (or, rather, to protect a plate that extended to the opposite batter’s box). It seems pretty clear that, whatever the effect on win probability, the umps mistakes were costly to the Jays and had a meaningful impact on the outcome of the game. Perhaps calls like these represent one more small step in the direction of robo umps. Eventually a tipping point will be reached. Those in favour of robo umps can only hope for more of these bad calls, in even higher leverage situations, in the World Series. In the long run, it may prove to be good for the evolution of the sport. True, that was a poor call as well. Would love to see the breakdown on both, to get a sense of which was more important. My gut says the one on Revere, but who knows without the numbers? I was thinking the same thing and looked into it a little. Using league averages, that call switches the odds of at least a tie from 60/40 in the Blue Jays favor to 60/40 Royals. The (big) caveat is that Wade Davis had a great year after 3-1 counts ( small sample size and also out of line with his career stats ). So if you want to say it didn’t matter because 2015 Wade Davis, then maybe it didn’t matter. But outside of that, you’re looking at a pretty hefty difference. I appreciate that you went to the effort to get and share the deep stats that are harder for the layman to find. Thanks. Thanks, Francis! I also appreciate the effort. There are more factors that go into making these estimates than I had realized. You really can;t directly compare Wade Davis’s career splits to this year. His career splits include his time as a starter which was a disaster. You need to look at what he did in 2014 when he was purely a reliever. I’m not sure what years he worked primarily as a reliever in his time in Tampa. Interestingly, Game 5 of the ALCS saw a wide strike zone to LHH that benefited the Blue Jays as Estrada got 3 called strikes that day on pitches out of the strike zone. 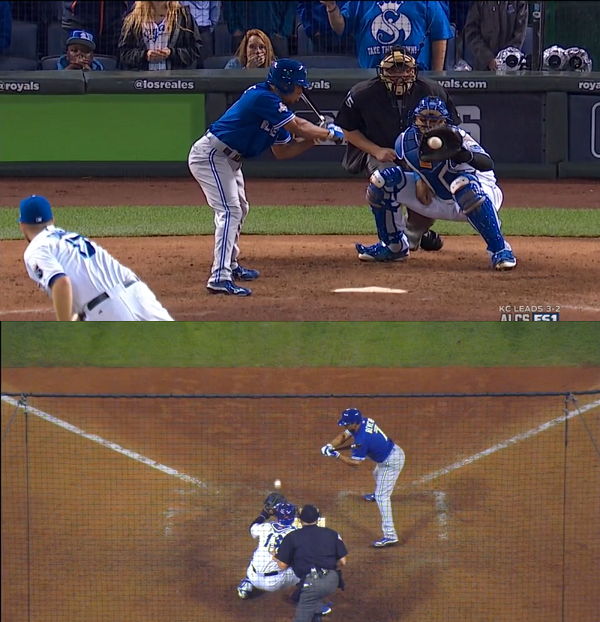 Game 6 had a wide strike zone for LHH as well, and this time it benefited the Royals. Wade got 1 call to Navarro and 1 call to Revere in his favor that were out of the strike zone. Herrera got the other out of the strike zone call to a lefty on a 2-1 pitch to Goins. To me the 3 erroneously calls that Estrada got in Game 5 evens out the 3 erroneous calls made on Davis/Herrera pitches in Game6. It has to come soon. It’s getting ridiculous. Brooks baseballs individual pitch maps are a bit off. Need to use the overall maps for accuracy.